When you connect to a etjumpserver and playing the first map the limbomenu looks well. Now, if you do reconnect, vid_restart, or the next map is loading, the limbo menu is broken. I guess it has something to do with the widescreen stuff. A other jumper and me having the same issue. i tried it with alot of different resolutions 4:3, 16:9, even tried on 16:9 and 4:3 monitor. If you need some some specific information, let me know. Make your install portable by copying it elsewhere, uninstalling the original one and then continuing playing with the copied version. Setting Extension Limit to 0x00004844 via Nvidia Inspector (Nvidia only fix obviously). I never got this fix working myself though, but it's supposed to fix this issue as well. 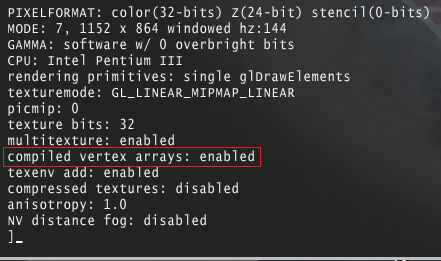 Once you have applied one of the fixes, typing /gfxinfo should say that compiled vertex arrays are enabled.